This Deserving Veteran Was Paired With His “Best Buddy,” Thanks To Your Support! W.A. is a Vietnam veteran who served in the Army. He cannot drive any longer due to his poor vision and struggles with balance and dropping items, as well as PTSD. He lives on a ranch and enjoys the simple life. His family reached out to Patriot PAWS after W.A. was no longer able to drive. His anxiety heightened. He needed help around the house when his family was away, and because of it, was experiencing more PTSD episodes. W.A. wears special prescription dark glasses, even indoors when necessary, to protect his eyes. You’ll see Butterfly’s eyes, too, look like she’s wearing her shades. A perfect match! Your purchases from the iHeartDogs store support charities that help make happy endings like this possible! 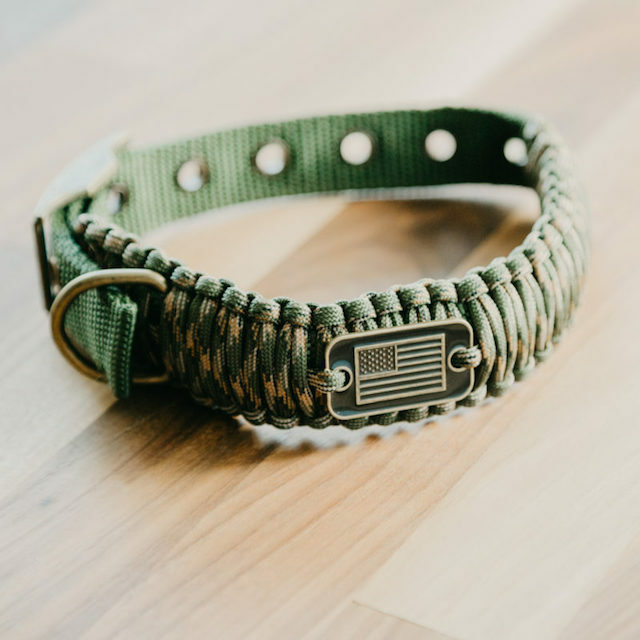 Adjustable Camo Paracord Dog Collar, $17.99–$23.99. 20% of sales are donated to help pair veterans with shelter or service dogs.